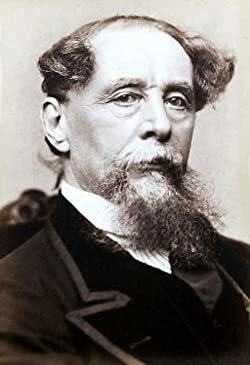 With his spotty education, it is amazing that Charles Dickens (1812 –1870) became a huge hit writer in his own lifetime and that his popularity as an author still endures. His dad was such a spendthrift that when Charles was 10, he was sent to live with an impoverished family friend while his parents went to a London debtors’ prison. To pay his board, Charles had to forgo his schooling and work in a boot blacking factory pasting labels for ten hours a day. In his twenties, he began his career as a writer and editor, pioneering serialized novels that became the soap operas of his day. He published 15 novels, and numerous short stories and essays. He also supported lots of campaigns for social improvement, not the least the end of child labor. Please enter your email address and click the Follow button to follow Charles Dickens! Tom Tiddler's Ground is presented here in a high quality paperback edition. This popular classic work by Charles Dickens is in the English language, and may not include graphics or images from the original edition. If you enjoy the works of Charles Dickens then we highly recommend this publication for your book collection. Charles Dickens is one of the most famous writers to have ever lived. Whether it be his timeless Christmas classic, A Christmas Carol, or a famous novel such as Great Expectations, most people are familiar with Dickens’ writing. This edition of Dickens’ Mugby Junction includes a table of contents. Bleak House was published in 1852-1853 and is widely considered to be one of Dickens' finest novels. This edition includes 10 illustrations. •This e-book publication is unique which include Illustrations and detailed Biography. •A new table of contents has been included by the publisher. •This edition has been corrected for spelling and grammatical errors. A Christmas Carol is a classic by Charles Dickens, which is a must read for any lover of literature. This edition includes 10 illustrations. A beautifully written novella by the immortal master, Charles Dickens. The Battle of Life is the fourth of his five "Christmas Books", and is presented here with original illustrations. •This e-book publication is unique which include Illustrations and Biography. •A new table of contents has been included by the publisher. •This edition has been corrected for spelling and grammatical errors. Chios Classics brings literature's greatest works back to life for new generations. All our books contain a linked table of contents. The Mystery of Edwin Drood is Charles Dickens' first novel. • The book includes 10 unique illustrations that are relevant to its content. The novel centers on the life and adventures of Nicholas Nickleby, a young man who must support his mother and sister after his father dies. His Uncle Ralph, who thinks Nicholas will never amount to anything, plays the role of principal antagonist. The story of an inheritance, this novel relates the contrasting destinies of two descendants of the brothers Chuzzlewit, both born and bred to the same heritage of selfishness, showing how one, Martin, by good fortune escapes and how the other, Jonas, does not. A reprinting of the 1843 first edition, complete with the original illustrations, is supplemented by over eighty related sketches and annotations on and analyses of the text and historical notes on the writing of "The Christmas Carol." Read this timeless masterpiece, specially formatted for your Kindle. This special e-book comes with illustrations by Arthur Rackham, which appeared in the first 1915 edition. •This e-book publication is unique which includes exclusive Introduction, Historical work and literary critiques. •This edition also includes detailed Biography. •A new table of contents has been included by a publisher. •This edition has been corrected for spelling and grammatical errors. In a world where injustice and oppression rule, a man named Charles Darnay is sentenced to death. However, another person is willing to take the sacrifice—in the name of honour ?and love. Part of a classic collection of Christmas Stories written by Charles Dickens. For the full collection, look for our version of `Christmas Stories` by Charles Dickens. The Chimes: A Goblin Story of Some Bells that Rang an Old Year Out and a New Year In, is a short novel by Charles Dickens with illustrations by George Alfred Williams. Published by T.P. James in 1874, James attempts to bring closure to Charles Dickens' unfinished work.